President Muhammadu Buhari, on Monday, paid a condolence visit on the Emir of Katsina, Alhaji Abdulmumuni Usman, over the death of the Chief Imam of Katsina, Liman Lawal. The visit came moments before the President flew back to Abuja after the conduct of Saturday’s APC Ward congress in the state. The Chief Imam had died, on Sunday morning, at the age of 95 leaving behind four wives and 27 children. His remains were buried later in the day after funeral prayers attended by Governor Aminu Masari, the Emir of Katsina, and other dignitaries from the state. Many Katsina indigenes also attended the prayers which took place in front of the Emir of Katsina’s palace. President Buhari arrived the Emir’s palace a few minutes after 10:00a.m and left about thirty minutes later. He was accompanied by Governor Aminu Masari, his Deputy, Maniir Yakubu and Secretary to the State Government, Dr.Mustapha Inuwa, among others. The President extolled the virtues of the late chief Imam, describing him as pious and humble. 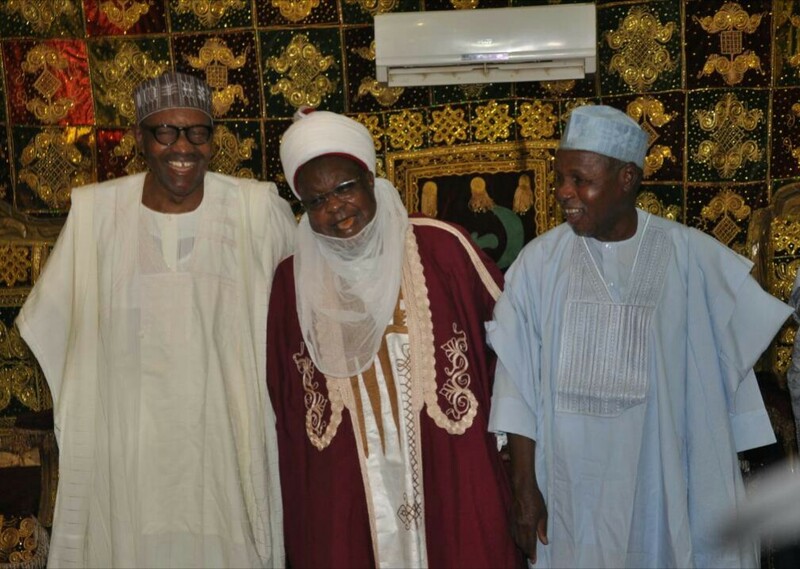 The Emir equally spoke of the good deeds of the late cleric, adding that Katsina would miss him.